The paper deals with data filtering on closed surfaces using linear and nonlinear diffusion equations. 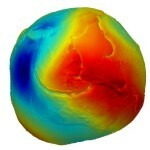 We define a surface finite-volume method to approximate numerically parabolic partial differential equations on closed surfaces, namely on a sphere, ellipsoid or the Earth’s surface.The closed surface as a computational domain is approximated by a polyhedral surface created by planar triangles and we construct a dual co-volume grid. On the co-volumes we define a weak formulation of the problem by applying Green’s theorem to the Laplace–Beltrami operator. Then the finite-volume method is applied to discretize the weak formulation. Weak forms of elliptic operators are expressed through surface gradients. In our numerical scheme we use a piece-wise linear approximation of a solution in space and the backward Euler time discretization. Furthermore, we extend a linear diffusion on surface to the regularized surface Perona–Malik model. It represents a nonlinear diffusion equation, which at the same time reduces noise and preserves main edges and other details important for a correct interpretation of the real data. We present four numerical experiments. The first one has an illustrative character showing how an additive noise is filtered out from an artificial function defined on a sphere. Other three examples deal with the real geodetic data on the Earth’s surface, namely (i) we reduce a stripping noise from the GOCE satellite only geopotential model up to degree 240, (ii) we filter noise from the real GOCE measurements (the component Tzz), and (iii) we reduce a stripping noise from the satellite only mean dynamic topography at oceans. In all experiments we focus on a comparison of the results obtained by both the linear and nonlinear models presenting advantages of the nonlinear diffusion.